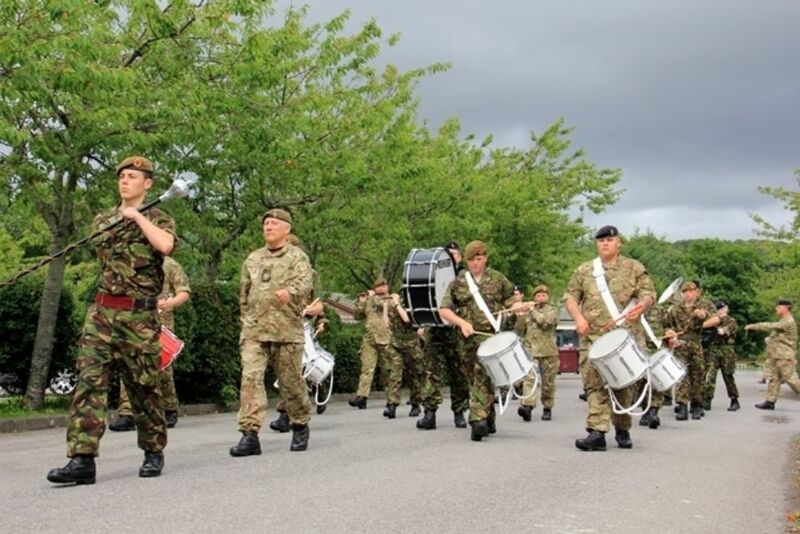 For the third year running, HQ Cadet Force Bands formed a touring band to visit Counties to promote music in the ACF. This year, WSSI Nicola Deary and the Royal County of Berkshire ACF provided the bulk of the players and the senior cadet was Cadet Colour Sgt Callum Mellis of Durham ACF. To add to the national nature of the tour, Drum Major Rob Morris and his wife, SMI Louise Baker-Morris of Clwyd and Gwynedd ACF provided the Corps of Drums element. HQ Cadet Bands were represented by Lt Colonel Mike Neville, National Training Officer. The tour moved first to Wathgill Camp in the Yorkshire Dales. Within 30 minutes of arriving, the band had agreed to entertain at the Lancashire ACF 4 Star dinner. This resulted in fine praise from the Cadet RSM for making the evening very special for the cadets. The cadets further entertained both the Sergeants' and Officers' Mess and formed a marching band for the final parade, playing alongside the County Corps of Drums. Next stop was Strensall, near York to visit Cheshire ACF. Both the Sergeants' Mess and then the Officers' Mess were "blown away" with the high standard of the music. A musical workshop also identified two cadets to play in the band and many more cadets interested in joining a Corps of Drums. Colonel Mike commented "The tour was a great success and I thank all my staff and the cadets. We were warmly welcomed by all the Counties, which we visited. We hope to see the cadets who showed an interest in music at the National Band Concentration at Longmoor in October." The band concentration at Longmoor is from 20 - 27 October 2013. All those interested in music, from a beginners level to skilled musician are welcome. Adult learner courses are also available. ACF bands, Corps of Drums and bugle platoons are encouraged to attend. Booking forms can be found on Westminster.